While Nazo no Kabe has a lot in common with Arkanoid, it departs from it in slight ways. It introduces concepts such as mid-bosses that must be hit multiple times before they are eliminated, something which is only seen at the very end of Arkanoid. Power-ups are provided by destroying the interfering monsters, and not the bricks. Throughout a few of the stages, letters can be revealed by various methods. The letters must be written down and unscrambled in order to enter the final code that will unlock the ending of the game. A prototype was developed for the United States, but never released. 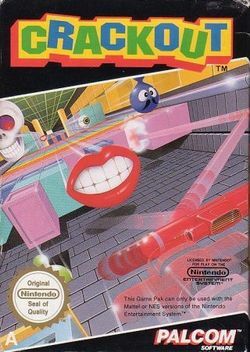 Instead, the game was converted to the cartridge format and released for PAL NES systems under the name Crackout throughout Europe as well as Australia. It replaces the disk saving feature with a password system that allows players to continue where they left off the last time that they played. In 2001, Nazo no Kabe was released for play (with simplified graphics) on various cell phones in Japan. This page was last edited on 7 June 2012, at 05:50.